“The biopsy came back conclusive,” spoke Dr. Graves, calmly and deliberately as she delivered my death sentence. “You have cancer, specifically mesothelioma.” The words stung as I stared at her in disbelief. Dr. Graves continued, “Mesothelioma is a rare cancer that affects the mesothelium, or rather the thin layer of cells that surrounds each of your internal organs.” Her voice trailed off. I could not absorb what was being said, all I could hear echoing in my mind is “you have cancer.” My dreams for a long and peaceful retirement crumbled as I tried to focus on the stoic voice of Dr. Graves. Some time later, once my family and I had adjusted to the realization that I was diagnosed with cancer, I began to research. I have always been a fighter, in fact, I fought in the Navy as a boxer during World War II, earning me the nickname “The K.O. King,” and so I’d be darned if I was going to allow this cancer to take me without a battle. The first step was to learn my enemy and, perhaps, discover its weaknesses. Although I did not normally spend time on the computer (admittedly I am a bit intimidated by it), I needed to know more about the type of cancer I had and I wanted the most current information. So I began to peruse all the mesothelioma information available on the Internet, I wanted to learn more about the malignant cells that now claimed my body as their own. I found that between 2000 and 3000 people are diagnosed with mesothelioma in the United States each year. This rare form of cancer mostly develops in individuals who were exposed to asbestos, many of whom were industrial laborers during the early to mid-20th century. According to the Mesothelioma Research Center website, by the 1970’s, the deadly effects of asbestos became apparent and, subsequently, the government placed a freeze on most asbestos products (commonly found in commercial and residential building materials, automotive parts, small kitchen appliances, and, even, cigarette filters). Unfortunately, for many American naval veterans, the damage had been done through service to our country. Thirty percent (30%) of patients diagnosed with mesothelioma are naval veterans. Asbestos was used on many naval ships because it was an ideal material due to its ability to resist corrosion and high temperatures. Therefore, it was used as insulation around boilers, hot water pipes, incinerators and steam pipes. I inhaled the dust from asbestos lining as I helped longshoreman to load bundles of insulation onto vessels, as I walked along the corridors of the ships in poorly ventilated areas, as I joked with fellow sailors who worked around the guts of the ship. As I read this information online, I sighed, feeling a bit sorry for myself, but quickly realized that I would do it all over again. I joined the Navy because I was willing to risk my life to protect this great country, I just did not expect it to come in this form decades later, when the threat of the Nazi regime was just a memory. Dr. Graves also told me that there were five forms of mesothelioma. The form I had was pleural mesothelioma, the most common, which develops in the lining of the lungs, or the pleura. 70% of all mesothelioma cases are pleural in origin. My doctor recommended that I simply enjoy my last days with my wife. When I told her I planned to fight it, she said normally cancer is fought with a combination of surgery, radiation, and chemotherapy as treatment, but she felt it would decrease my quality of life. I knew I was on my own, if I chose to fight and I didn’t want to go through chemo or radiation, if it could be avoided. I had heard of alternative treatments from other cancer survivors and wondered if I could implement some of their survival strategies in my case. I found my inspiration while reading the book, “They Said Months. 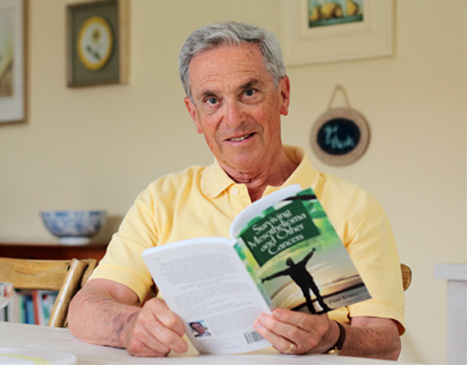 I Chose Years!” – authored by mesothelioma survivor, James Rhio O’Connor. At the age of 61, O’Connor was diagnosed with mesothelioma and experienced much of the same things I was going through, and, like me, he was determined to survive. He spoke to scores of clinical physicians and researched his illness extensively. O’Connor extended his life an additional 7.5 years through managing his diet, taking supplements, and incorporating the power of his mind to manage and control pain. He lived until the age of 69. His sheer will to overcome such a dire prognosis settled my resolve. I concluded that I would not rest until I saw similar results. I had found my enemy’s weakness. I could positively change my final years by simply making the conscious choice to combat my cancer through diet and nutritional supplements. I learned how to detoxify my body, to increase my intake of Vitamin A and to decrease my consumption of sugar. I am motivated and encouraged to enjoy my final retirement years. I don’t expect it all to be easy, but l am looking forward to spending time with my lovely bride, who I have to say is still lovely after all these years, and I will take her on vacation, because I choose to go for my enjoyment, and not because I am fearful. I am not deceived, I know I am not immortal, but, as I said, I am a fighter and I intend on winning this fight.